For all Punjab boards the date sheet of 12th class will be announced available on this page after the official announcement by the respective boards. As you know the exams will be conducted in April of May for intermediate classes and for any course in 12th class. The boards will announce the datesheet for 2nd year annual exams one month before the examination dates. 12th Date Sheet 2019 will be uploaded right here on this page as soon as boards will announce it. From Punjab to Sindh, Balochistan to Khyber Pakhtunkhwa and AJK annual exams for 2nd year classes are being conducted by Board of Education in Pakistan and they have their own schedules. You don't have to further search for your respective board date sheet and download from other sources. 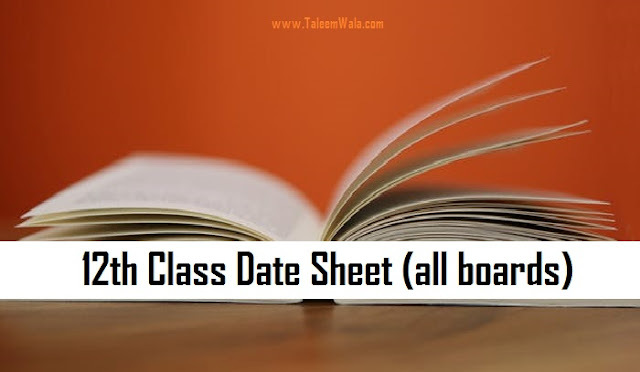 Here you can click on your board name and you will get your date sheet on the next page. So, from this page you can view online or download date sheet of annual exams for all boards in Pakistan. If you need more information you can comment below.